With the limited offer of either fruit or sponge once being the only choice for the traditional wedding cake it is a refreshing and delightful change to see the many varied selections of tastes, textures and colours we can now choose from. Snowy white iced three tiered cakes decorated with silver horseshoes and hearts were once the shining glory of days gone by and many black and white photographs of brides and grooms cutting their cake certainly show how popular the traditional wedding cake was and indeed still is today for many couples. Wedding cakes today have quite rightly found their place in the top ten on any bride's list and it seems that no reception is complete without one. Now being offered so much choice it's no surprise that some brides and grooms are breaking away from the traditional way and want their wedding day to be completely different, unique and totally personalised to them. There are a lot of options for an alternative to the classic wedding cake, the only real limit is your own imagination. Here are some ideas to get you thinking. Placed in tiers these mini cakes can be a great alternative with the added bonus that you can have several different flavours. Choosing this style will not only give your guests that perfect portion but it is far easier to transport if making yourself. Toppings on cup cakes can run from personalised initials to flowers, from butterflies to sweets or can match any theme you may have, in fact the list is endless. 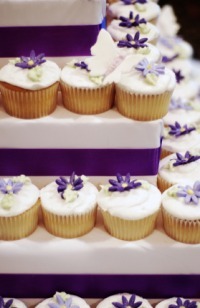 Cup cakes can also be used at each place setting which can then double up for a dessert and wedding favour. These can be homemade or commissioned by a bakery depending on your budget or baking skills. They can be laid out flat on a table or piled high on a plate with sugar paste used to build and stack them into tiers. Wedding cookies can be made in the shape of wedding cakes, bells, hearts and flowers or even likened to your theme or seasons. This popular alternative to the wedding cake is fast climbing to the top of the list in wedding packages. With every flavour on offer this versatile and rich mouth-watering cake can be made or purchased in any shape. Given pride of place on a traditional cake stand it is sure to go down a treat with those guests who have had their fair share of the fruit or sponge tastes of cakes before. 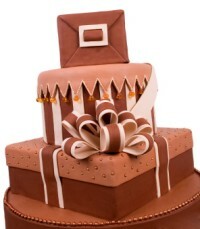 One cake can be placed on each table allowing you more scope with your theme. These tables cakes can be all the same or made to represent each table name (if you have one), a place you have visited or a combination of how and where you met. Your favourite doughnuts can be stacked into an amazing tower of iced delights. Covered with icing sugar and sprinkled with chocolate and/or coloured sugar balls this elevated mass of scrumptious sweet dough can be likened to a wedding cake with white icing and silver edible beads. Bows and ribbons made from rice paper can also be used to decorate and cascade down your doughnut heaven. For the sweet toothed bride you can go all out and have a dessert buffet of different tastes ranging from cakes and fruit to chocolate fountains and pies. Plates piled high with profiteroles, cookies and brownies with bowls of melted chocolate for your guests to dribble over their desserts will not only delight your wedding party but could help in keeping down the cost somewhat. Smaller dessert tables for children can offer them jellies, mini iced cakes, jam tarts, jelly beans or individual trifles. For those getting married in the autumn your dessert buffet table could hold apples on sticks with bowls of caramel for your guests to dunk their apples into. Blackberry toffee and/or bars of fudge, hot fruit pies with custard but please remember to have these tables supervised if children are to be at your reception. For all you chocolate lovers out there, the chocolate fountain provides an irresistible aroma and beautiful display of cascading luxury Belgian chocolate to tantalise all who see it. Your guests can dip a variety of fondue foods into the fountain including marshmallows, strawberries, exotic fruits, Turkish delight, nougat, honeycomb and profiteroles. Your guests will be offered a truly luxury dessert they will no doubt enjoy making up the many different tastes on offer to treat their pallet. A tower of pastries held together with caramel or syrup and can be decorated with threads of caramel, chocolate flowers, sugared almonds or ribbons. 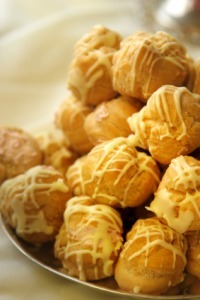 Each profiterole is filled with fresh cream and this has been the traditional French wedding cake for over 300 years. This wondrous dessert can be served with melted chocolate, ice cream or fresh cream but is not really suitable to stand for any length of time at outdoor weddings in the summer as the caramel or syrup could melt and leave you with a flat mass of pastries. 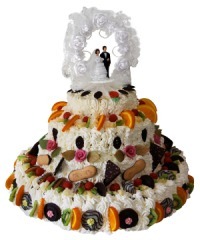 Different types of cheeses stacked on top of each other in the form of a tiered wedding cake and decorated with grapes or fruit in the same way as the traditional wedding cake is done with flowers. This versatile cake can become a tasty final course served at your wedding reception or used in the evening with a selection of crackers and wines. Fresh fruit can be piled up into wonderful colours that match your outfits, season or theme of your wedding. Imagine strawberries piled high with blobs of fresh cream or a summer fruit cake of lemons and limes or autumn fruits such as apples and oranges and layers of blackberries. Cakes made entirely of ice cream and decorated with a huge choice of goodies such as nuts, fruits, sweets or fresh cream. Ice cream cakes nowadays can be styled in many ways but because of the melting factor a lot of thought will need to be taken if this is what you choose. Your ice cream cake can be brought out just for the traditional bride and groom cake cutting and photographs and then placed back in a freezer until it is time to be cut up and handed around. When it comes to your wedding menu the sky is the limit and your imagination can run wild when it comes to making your choice of an alternative wedding cake making it one of the most special ones you and your guests will have seen and tasted. Whatever choice of cake you decide on one of the secrets to an alternative wedding cake is really presentation. Stacked tiers of just about anything can be turned into a work of art and given its rightful place in any wedding reception. For those that don't want to have a wedding cake simply because you don't like cake, your budget won't run to one, you just don't want one, you want to be different, or for whatever reason, remember it's your day, your wedding and therefore completely up to you what, if any cake, you decide to go with.